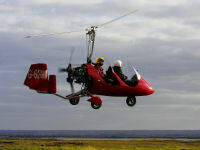 Product review: Rochester Autogyro – by anon, 19 Jun 17 5/5 Excellent "This was arranged for me.Easy to find venue.Visitor facilities not the most modern but fine.Staff highly experienced and happy to chat and answered all questions. Staff and equipment inspired confidence.Yes,briefing was fine.Really enjoyed it,would certainly recommend and may do it again.Yes, took photos and had a chat.Not arranged by me but happy with the whole thing. " Upon arrival at the airfield you will be greeted by your Instructor who will run you through a safety briefing and will answer any questions you might have relating to the safety of your flight. Tea and coffee will always be on stand-by. All our aircraft are equipped with dual controls, and you will occupy the captain's seat in the front with one of our experienced flying instructor in the back (at Instructor's discretion)- it is the best seat in the house. Throughout the Trail Flight you will be encouraged to take the controls for most of the flight with the instructor intervening mainly during the takeoff and landing phases of the flight. After this experience you may ask further questions relating to this aircraft and we would only be too happy to answer them for you. Any time flown during a Trail Flight will count towards the PPL(G) course should you decide to take up flying. You will also be given a certificate upon completion so you may remember your experience for a long time after. Maximum weight 16 stone and maximum height 6'4". Age restriction is 16 years of age and minors have to be accompanied by an Adult. Please bring gloves and good footwear on the day. We supply the flight suit and the helmet with headset. On site facilities include a cafe where refreshments can be bought. Family or friends are always welcome, please bear in mind though that the airfield is active and certain precautions have to be taken. This was arranged for me.Easy to find venue.Visitor facilities not the most modern but fine.Staff highly experienced and happy to chat and answered all questions. Staff and equipment inspired confidence.Yes,briefing was fine.Really enjoyed it,would certainly recommend and may do it again.Yes, took photos and had a chat.Not arranged by me but happy with the whole thing.